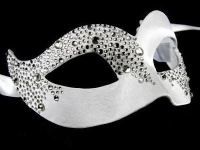 Add instant glamour to your look with this chic and stylish masquerade ball mask for a man or woman - Great Value! Guaranteed to add a show-stopping touch of glamour to any of your looks, this stunning monotone Vivian Arco B masquerade mask by Simply Masquerade is the thing to buy and be seen in this season. This fabulous mask for a man or woman is fastened with traditional black ties and features a antique white painted papier mache base with black segments that really stand out. Guaranteed to turn heads, this ultra chic is designed to put your every party look in the spotlight. All Simply Masquerades Venetian masks are hand made and painted in Venice and are great value for money. No two masks are ever identical. Colours and patterns WILL vary!